In the next few days, US Secretary of State John Kerry will visit the five Central Asian countries of Kazakhstan, Kyrgyzstan, Tajikistan, Turkmenistan and Uzbekistan. Our organizations — Kazakhstan International Bureau for Human Rights and Rule of Law, Nota Bene, Turkmen Initiative for Human Rights, the Association for Human Rights in Central Asia and International Partnership for Human Rights — urge him to use his visit to prominently raise human rights concerns with the Central Asian governments and to speak up in support of the region’s hard-pressed civil society. During his visit, Kerry will hold bilateral and multilateral talks with senior government officials from the Central Asian countries, including at a meeting with the foreign ministers of all five countries in the city of Samarkand in Uzbekistan. 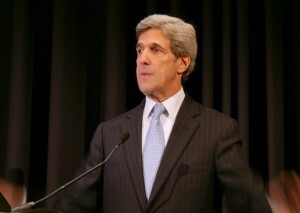 Kerry’s visit comes at a time when civil society in Central Asia is under more pressure than ever. In the context of political developments in the wider region and the current economic downturn, the Central Asian authorities have exploited concerns about national security and stability to step up rhetoric and tighten measures against civil society actors who criticize government policies and advocate for human rights, justice and rule of law. It is imperative that the Secretary of State uses his visit to condemn this alarming trend and to express strong support for civil society groups and activists at risk in the region. While existing legislation sets out strict requirements regarding the operation and funding of NGOs in the Central Asian countries, new restrictive provisions on the funding of NGOs have recently been initiated in Kazakhstan, Kyrgyzstan and Tajikistan. Draft legislation currently pending in Kazakhstan’s Senate may result in that a non-independent body is granted monopoly over the allocation of grants to NGOs, including grants from foreign donors. A Russia-inspired “foreign agents” bill that passed the first reading in Kyrgyzstan’s parliament this summer could be used to stigmatize and obstruct the work of basically any foreign-funded NGO. There are also concerns that new legislation adopted in Tajikistan in August 2015, which requires NGOs to report all funds received from foreign sources to the government prior to using them, may be used to restrict NGOs’ access to funding in violation of international standards. NGOs have made active efforts to influence and improve these legislative initiatives in the three countries, but their suggestions have been largely disregarded. Government regulations in force in Uzbekistan set out onerous requirements with respect to obtaining and using foreign grants, which effectively bar access to such funding for NGOs. According to Turkmenistani legislation, foreign grants received by NGOs must be registered with the government and are subject to close scrutiny. In the current climate, Central Asian NGOs and their leaders have increasingly been singled out for negative and discrediting statements by government representatives, public figures and public media who have accused them of promoting ”foreign” interests and values and of undermining national security, stability and reputation. NGOs that work on “sensitive” issues such as human rights have also been denied registration and closed down on various pretexts in the region. Several human rights NGOs are currently at the threat of closure in Tajikistan because of the alleged failure to comply with administrative and technical requirements. If adopted, the new NGO legislation under consideration in Kazakhstan and Kyrgyzstan could lead to closures of human rights NGOs in these countries. In Uzbekistan, it is practically impossible for independent human rights NGOs to obtain mandatory registration, as a result of which such groups are forced to work without legal status. Independent Turkmenistani human rights groups can only operate underground or in exile. Numerous NGO activists from these two countries have had to flee abroad because of the repressive climate, and there are reasons to fear that this may be a growing trend across the region. In the recent period, new cases of intimidation and harassment of human rights defenders, civic activists, lawyers and other outspoken individuals have been reported in all the Central Asian countries. Cases where such individuals have been arrested, charged and imprisoned in retaliation for exercising their rights to freedom of expression, association and assembly and other fundamental rights are of particular concern. Recent worrying examples include the arrest of civil society activists Ermek Narymbaev and Serikzhan Mambetalin in Kazakhstan in October 2015, the arrest of lawyer Buzurgmehr Yorov in Tajikistan in September 2015, and the reported three-year prison sentence handed down to Radio Free Europe/Radio Liberty correspondent Saparmamed Nepeskuliev in Turkmenistan in August 2015. Some human rights defenders and dissidents imprisoned after unfair trials in the region have been behind bars for years already. There are serious concerns about the health and well-being of these individuals, including among others Azimjan Askarov, who continues to serve a life sentence in in Kyrgyzstan, and Azam Farmonov, who in April this year was given an additional five-year sentence in Uzbekistan instead of being released after serving out a 9-year sentence. More information about current concerns regarding the situation of civil society in Central Asia is detailed in a briefing paper, which was issued by our organizations on 22 October 2015. According to a press statement issued by the US Department of State, US Secretary of State John Kerry will visit Central Asia after attending Syria talks in Vienna on 29-30 October 2015. He will travel to Bishkek, Samarkand, Astana, Dushanbe and Ashgabat on his tour to the region, which is scheduled to end on 3 November 2015.